This past week I tackled two books that were difficult to read: Orphans of the Living: Stories of America's Children in Foster Care and On Their Own: What Happens to Kids When They Age Out of the Foster Care System. Both books are similar in that they tell the stories of children who grew up in foster care. Orphans of the Living looks at 5 children and On their Own looks at 10 children. On Their Own focuses more on the aging out process and how children were (or likely were not) prepared for to enter adulthood on their own. Both books are depressing, but only one is worth reading, in my opinion. Orphans of the Living is just too dark. Don't read it. I sort of wish I hadn't. On Their Own does a much better job of offering a balanced approach. Still depressing, but well written and includes steps for how we as individuals and as a country should move forward and better prepare foster children. It helped me to see how so many foster children become jobless and homeless, but how others, who grew up in similar situations, but with a few key differences, could become well-adjusted, successful adults. If you can stomach depressing true stories, this book is a worthwhile read! Annery, I think the difference is a combination of writing style and the material they chose to present. 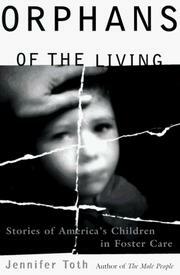 Orphans of the Living goes into much greater detail of the exact incidents that occurred. The first two stories in Orphans deal with sexual abuse between children in group homes. I actually stopped reading the book at that point and almost didn't finish. Ultimately I wanted to finish because I know these are real people with real stories to tell. But I think On Their Own does a much better job of telling stories without going into gruesome detail. I also think On Their Own picked a better sampling of children, which allows the book to convey a more complete picture of the foster system. One more thing I just thought of... the author of On Their Own seems to have more compassion for the people she is writing about, which I appreciated! Thanks for the heads up on Orphans of the Living. I do have a friend who eats up books like that, and documentaries, and made-for-tv movies. Then she loves to tell me about all the most depressing parts. Are there any "good" documentaries on the foster system? My immediate and extended family has some experience with fostering babies from Catholic Charities in the late '70's early 80's. My aunt and uncle were the first to foster a baby who they had for 9 mos. right from the hospital when she was born. They and their 3 children fell in love with her and were considering adoption when they got the call that they found a family who was will to adopt her. They were devastated when "Mary" was taken away so they decided they couldn't take breaking that emotional attachment over and over again. Now having said that, it was more typical at that time that infants were moved from foster homes every 3-6 months to avoid foster families getting too attached. Catholic Charities found they lost foster families who were in short supply either because they ended up adopting the baby they were fostering or quit because of the emotional toll when the babies were left with them too long. Sometimes though, there was no where to move the babies that often and they stayed put for longer than that, like which happened to "Mary". My parents decided to also take in newborns and the first three were indeed taken away to another foster home between 3-6 months and although I was only about 8 or 9 at the time, I remember my mom standing at the sink after each one left and crying and washing dishes. The 4th baby, who was a boy, stayed with us a year and my parents ended up adopting him. They stopped being foster parents after that so although I can see Catholic Charities reasoning in moving the babies in order to preserve the chances of their foster families continuing to accept kids, I really feel for those babies who are being moved to new homes every few months and having to attach and reattach somewhere else. Lastly I have a cousin (a daughter of my aunt and uncle who had baby Mary) who had 1 daughter and could never conceive again. When that daughter was about 13 or 14 they attempted to adopt two boys who were 1 and 3 but it didn't work out. The emotional problems they had were beyond what my cousin and her husband felt capable of handling. They had to send them back after the trial period. My cousin was really down on herself about not being able to handle it but we all have to work with what God gives us. A year later she adopted a baby girl and when that baby girl was a year old, she surprisingly conceived another baby who is a girl. It is so fun seeing her two little girls play together and her older daughter really enjoys her two little sisters. Why am I telling you all this? I guess because I wanted you to hear some good outcomes for some of these kids although it is very saddening for those who don't have happy endings.